Christina's World. 1948. Tempera on gessoed panel, 32 x 48"
The Museum of Modern Art, New York. 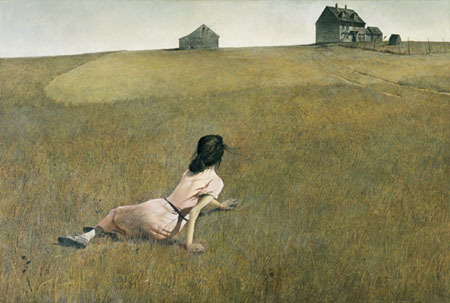 Please click on the image above to view the Museum of Modern Art web page on Andrew Wyeth. This page is in honor of one America's most beloved artists, Andrew Wyeth, whose masterpieces of content and form have helped to shape representational art in the world today. The MBNA Wyeth Center at the Farnsworth Art Museum web site. Andrew Wyeth Original Works The Official site for Andrew Wyeth's Representative, Frank E. Fowler. This site includes available original works. It also includes a Chronology of Exhibitions of Andrew Wyeth's work beginning in 1936. Frank Fowler has represented Andrew Wyeth for more than thirty years in the placement of his original artwork.